Sharon and I decided on the way home that this was the best SPA ever. Of course, I think we say that every year! I guess that means that it just keeps getting better, though, and that’s okay by me. We went up on Thursday this year and that was a really good decision. We had a whole extra day to spin, relax and just hang out. By Friday afternoon most of our friends had arrived and the party was in full swing! The rest of the weekend flew by, punctuated by uproarious laughter, excellent food, fine tequila, and lots of spinning. I want you to know that I carried my camera around all weekend. And I never took a single photo. Talk about camnesia! I guess I was just having too much fun being in the moment to try and capture any particular moment. I did take one picture when I got home, though. This is the spinning I did over the weekend. Two bobbins of Crown Mountain Farm Sock Hop (from back in the Teyani days) and one bobbin of Foxfire Farm cashmere/silk. I told you I did a lot of spinning. Apparently it was all purple! The rest of the weekend you’ll just have to imagine. It was great! I have pictures from Saturday night — will post them later. Of course it was great! You were will grrlfriends. I’m envious to say the least. I didn’t take all that many pics either, and didn’t get to just “hang” as much as I’d’ve liked… next year, next year… But you’re right, every year SPA seems better! I think it is because every year I know more people. It’s always great seeing you!! Your photo is wonderful, and good for you for just enjoying yourself! That’s what it’s all about. It was an awesome SPA! So many highlights- esp sipping tequila on the rocks with lime at the wheel. I need to get one of those cup holders for my wheel from Kelly R.
Pretty singles. 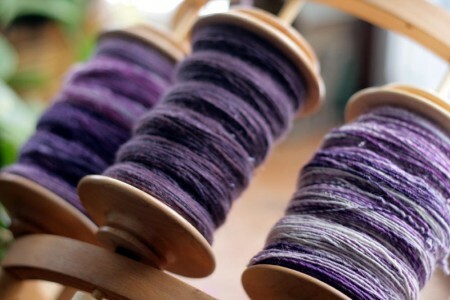 Plying today on your day off? That photo, more than any other, makes me want to learn to spin. I mean it. And I think that having camensia means that you must have been relacing and having fun 😉 Good for you – so well deserved. It was a really great weekend! It was wonderful to see you again. I’ll be posting pictures soon. I know what you mean about the camera. I’ve had whole vacations where I have argued that I was more interested in enjoying the vacation than recording it. Of course, now that I blog, all bets are off. LOL! I’m that way about taking photos at events too – I’d rather be there enjoying myself in the moment than worrying with a camera! I miss the Teyani days! Oh god you sound like me! I never take pictures at those things. duh???? I think I just get caught up in the moment. I do love the purple – very purtttty. Sounds like you had a lovely time. And you got back before all this snow hit! I’m so glad you had a good time. Love the spinning. I need a spinning weekend like that. Gorgeous purples. Purple is the color of royalty, and it sounds like you had a royally good time! Such a good weekend. I only wish I had enough time to hang out with all of my friends more. I like your idea about going up on Thursday night. I might have to do that next year! I’m sure it was a blast and apparently productive too. Soooo jealous. Beautiful spinning :o) I didn’t take any pictures at my anti-spa get together on Saturday (hence the no post today, heh) Glad you had a good time! I don’t have to imagine it! I’m glad you posted that picture, though, because I was having too much fun to notice what you were spinning. My bad, it’s gorgeous. I “imagine” it was wonderful! I agree. ANd I took no pictures either. My new batteries weren’t. It sounds like a wonderful weekend. Good for you! You know you’re having a great time when you don’t get around to taking any pictures. Glad you had fun! Sounds like a great time, Carole. Yay, Purple!